Drag and drop the MP3 Player Widget located in Widgets > Media. You can upload your audio file either directly from your computer or from your File Manager. Click on Widgets > More > Misc. 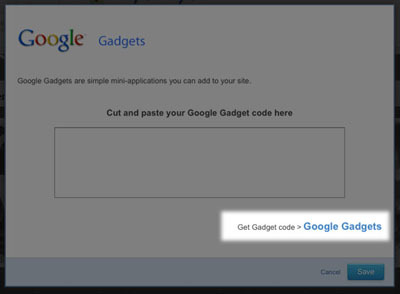 Drag and drop the Google Gadgets Widget onto your page. Click on the "Google Gadgets" link on the bottom-right of the screen and you will be taken to the widget gallery. Browse for the MP3 Player you want and click on "Add to your webpage". Customize your settings and add your music URL (further instructions below). Once completed, click on "Get the code". Copy the HTML code given and paste this (using right-click>paste or CTRL-v) into the Google Gadgets dialog box in your Sitebuilder. How to locate the music URL? Replace "mysite" with the name of your published site. 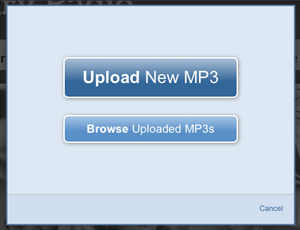 Replace "song.mp3" with the name of the music file you've uploaded. Remember to include any folder names in the file path if your file is stored in a folder in the File Manager. For example, if you have music folder: "resources/music/song.mp3". In the HTML Editor that opens up, paste in your code.